Love Stinks: Our Relationship With an Unusual Pet Wasn't Meant to be | Use Your Words | Kids VT - small people, big ideas! We provided Yogi with food and shelter, but he did not reciprocate with the affection we so desired. I cried for weeks when my childhood cat, Sheba, died. She was a force to be reckoned with. If you tried to move her from our royal blue armchair, she would hiss. Yet she would also curl herself into the hollow of my legs in the middle of the night, her soft body emanating warmth that soothed my fears. I assumed that when she died we would get a kitten. But my mother informed me and my three sisters that we would never have another furry pet; medical testing confirmed she was allergic not only to cats but dogs as well. For us this was tragic news. It hit me and my older sister, Tamara, especially hard. Instead of giving up and just getting a goldfish, Tamara got creative. Surely there must be other appealing pets besides cats and dogs. She was determined to have something different. She found what she was looking for while searching the newspaper's classified ads — a farmer in southern Québec was getting rid of a skunk. Tamara imagined us walking down the street with our pet skunk on a leash; the image was seared into her brain. 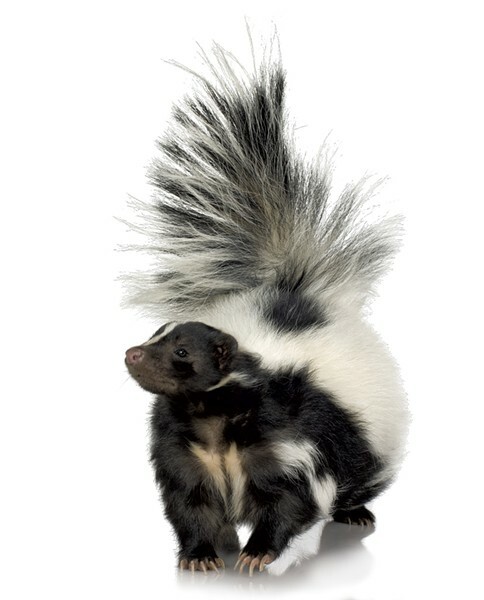 She reasoned with our parents that while a skunk seemed like the antithesis of a sweet household pet, once it is de-scented — a process where a vet surgically removes the glands that secrete a foul-smelling liquid — it is an adorable, cuddly animal. Or so we hoped. Surprisingly, my mother conceded. My father drove from our home in Montréal to the farm to pick up our skunk, Yogi. I was beyond excited to meet this new family member. A skunk! What would all the kids at school say? Yogi, it turned out, was not that excited to meet us. It would be putting it mildly to say he arrived in a foul mood. He had been de-scented, but all his instincts were intact. When we approached him, he would back up, stamp his two little front paws and lift his tail high in warning. For the first few days we couldn't even get near him. My parents did not want him roaming the house, so we set up a cozy closed-off area in the basement. He tore it apart. From my bed on the second floor I could hear Yogi searching desperately all night. Was he looking for food? A familiar scent? Something to play with? Fellow skunks? Day after day I tried to approach Yogi when I got home from school. Sometimes I brought my best friend to see if we could pick him up. His pointy little nose and beady eyes looked alternately scared and sad. He stomped his feet at us and tried to bite our outstretched hands. Clearly, he did not want to be our pet. In a recent New York Times article about her parents' giant tortoise, novelist Hanya Yanagihara describes pet ownership as "an act of assumed, albeit unacknowledged, reciprocity" — that of food and shelter in return for the animal's unconditional love. In other words, we have expectations of our pets. Specifically, "loyalty and dedication, and we want these things to be expressed in a way that we can understand." We provided Yogi with food and shelter, but he did not reciprocate with the affection we so desired. The day my parents returned Yogi to the farm, Tamara and I were devastated. She went on a long bike ride to pedal away her pain. Looking back, I understand our sadness as a kind of unrequited love. Decades later I have the satisfaction of owning a pet that can reciprocate in a way I understand. We recently got a puppy, Finch, and I am struck by how she innately knows what my four children want. She nips and wrestles with my 2-year-old the way she would another puppy; she sleeps all night with my 10-year-old who suffers from nightmares; she goes for long walks with my 12-year-old who loves the silent companionship; and she gently and loyally plays fetch with my 7-year-old who has always been cautious around dogs. In return, we give her food, shelter and lots of kisses. Recently I asked my dad what happened when he returned Yogi to the farm. He said the farmer exclaimed "Yogi! Yogi!" as he picked up the skunk and kissed him. As for Yogi, my dad said he seemed happy to be back. I wondered why it didn't work out for us. Was it a poor match? Perhaps we didn't try hard enough. Or maybe Yogi's heart was broken, and he was longing for his original home. Whatever the reason, we never got to snuggle our skunk, never mind walk him down the street. But my friends were still incredulous when I showed them the black and white hairs I kept in a special treasure box. I'd take them out and feel the coarse strands, proof that — though never truly a pet — I did once own a skunk.